The Alps in my backpack was created by members of the ALPARC Working Group “Mountain Environmental Education in Alpine Protected Areas” and is a multifunctional pedagogical tool to be used in animations on the field, in connection with the Alps, the mountain heritage and the alpine protected areas. 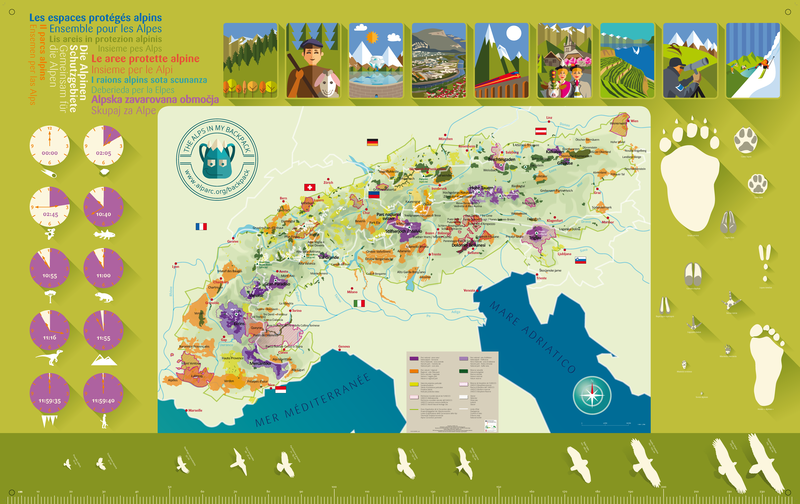 Measuring 240 x 150 cms and printed on a resistant fabric, it presents the map of the Alps and their main protected areas. The tool is adressed to any educators and responible for educational activities. It is either for outdoor and indoor activities. A fachsheet translated in all the alpine languages supports the educators on how to take the best out of the tool. If you are interested in the tool you can contact ALPARC.